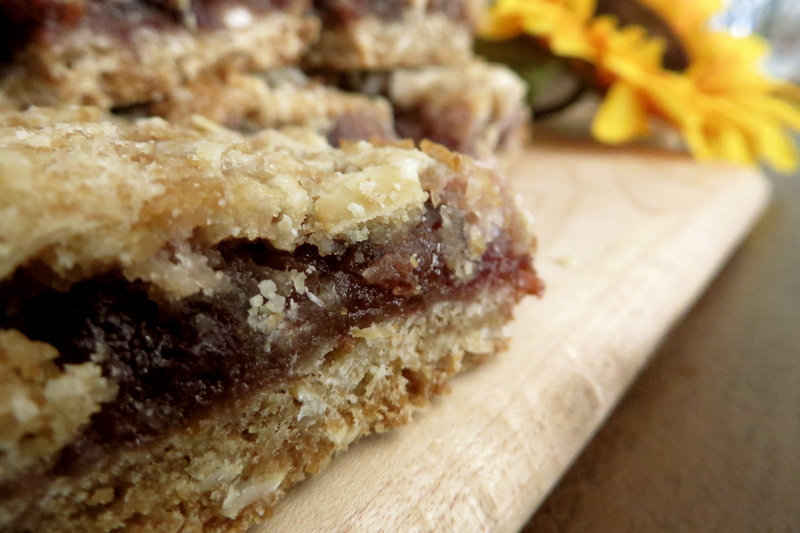 Try saying “Would you care for a strawberry, rhubarb, coconut, date and oat square?” Quite a mouthful eh? Once you’ve tried one, I warn you they are pretty addictive. I was trying to use up some of the delicious jams that we had bought on our recent trip to Quebec. We bought about four jars of an assortment of freshly made jams from a nearby farm. I wanted to use one of the jars in a baked good and immediately our dear friend Selma’s recipe came to mind. I adapted the recipe to incorporate dates, lemon zest and extra coconut just because I enjoy those last two ingredients. You can make this entire recipe in just one bowl, which saves time and a lot of washing up too. I’d urge you to check Selma’s page for tips and tricks on preparing your baking tin. Here is the recipe from Selma’s blog with a couple of extra ingredients that I added. We finally have some decent weather on the East Coast of the USA. 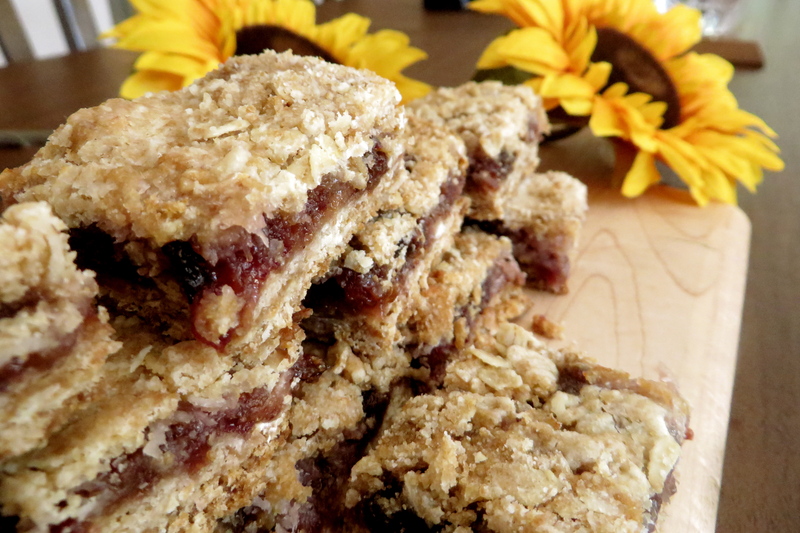 It had been far too hot and humid, so I wanted to celebrate Fall by baking these wonderful squares. There was a slight chill in the air early this morning, imagine the aroma wafting through the entire house when they were done baking. I’m excited about the possibilities of bringing on more Fall related dishes, so my dear readers, stay tuned. Combine the flour, sugar, dates, lemon zest, oats, baking powder and salt in a medium sized bowl, mixing well. Set the prepared baking tin onto the scales and set to zero. Measure out 300g of the mixture into the baking tin and press evenly onto the bottom of the pan. Make sure to get into the corners. Smooth the top by running a flat bottomed glass over it. Spread the jam over the surface to within 1 cm of the edges. The jam spreads as it bakes so this prevents it from seeping from the edges and burning. Ha ha both Ana, but healthy too which makes me reach out for another :). Thanks for stopping by. I just wish i could reach in and grab those squares! What an amazing combination of flavors! I like how the coconut is spread on top of the jam.You are such a true friend to honor Selma and give due credit to her recipe. God bless you. I am book marking this recipe to make soon! Yes it is getting cooler in the mornings here too. Thanks Sandhya, it was a fusion of all types of flavors I’ll say, my palate was pretty happy. I love coconut too, I bought some frozen grated from the Indian store just this weekend, and I plan to use it more often. I made a pear/blueberry crumble last night after dinner, I tossed in some almond flour and coconut among other ingredients, and it was just gorgeous (without the AP flour). Yum! the crumble sounds scrumptious too! Great combination of flavors. Loretta! Where do you get the almond flour? You can pick up almond flour at any grocery store I’m pretty sure. It is pretty expensive, but in some desserts it is much better than AP flour. I’ll check out your Guava modak now. Thanks. I will check out my grocery stores. Loretta, these are gorgeously delicious! You could jumble the title a bit and call them “CROSS bars or CROSSED bars? I love that it is a bit cooler here too. It makes me want to get into the kitchen again. Grand idea Julie, they were criss-crossed bars of sorts :). Yes, I can’t wait to see what all the bloggers pull out this Fall. I always get pretty excited about the cooler weather which bring my favorite types of foods to the table. Thanks for stopping by. 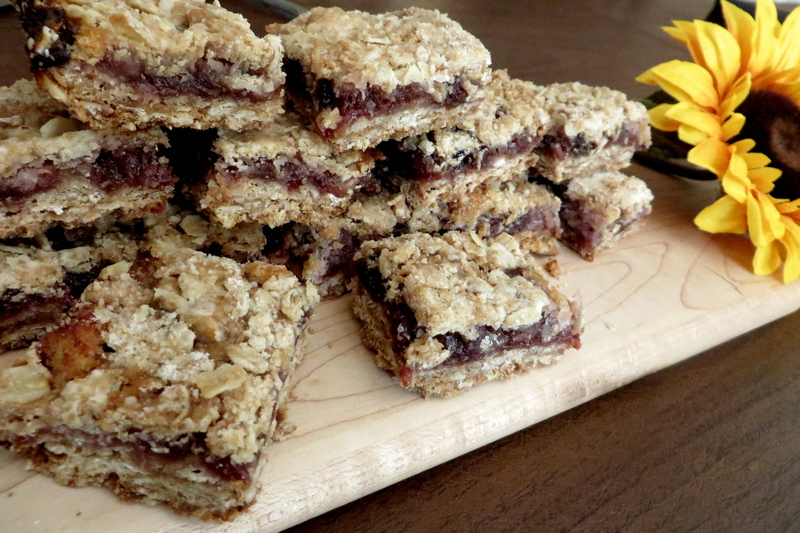 These are absolutely delicious looking treats and the recipe is so doable.. Love them Loretta! I’d be happy enough with just the strawberry and rhubarb – but the dates and coconut sounds great also! Thanks Lili, it even tastes real good for breakfast, oats and jam are part of the breakfast group of foods anyway. I hope you’re doing well? Thanks Fae, it sure was, being a healthy treat always makes me want to cheat some more, so I double the intake :). Love rhubarb, but have never grown it. I’ll have to remedy that soon. Thanks for stopping by. Yes long time…I’ve been so busy…finally back X hope you’re well! What an amazing and healthy treat Loretta !! Thanks Freda, it really was. Thanks for stopping by. These look delicious, great idea for using up any bits of jam. Thanks Liz, yes it definitely was a great idea, and the fact that the weather is not as hot and humid gave me an incentive to bake some Fall like goodies. Thanks Elaine, yes, our good friend Selma, gone, but will never be forgotten! Yes, yes, yes, I would like them. An easy recipe the way you prepared them too. The weather is changing, and we had a few days of really chilly weather, perfect for those fall treats. Thank you! We had some nice cooler weather for a bit too, but now back in the 80’s, but grateful it is not humid. Love squares of any kind and these are fantastic! Still not getting yournposts in Reader nor email Loretta. It says I am following your blog. Weird. 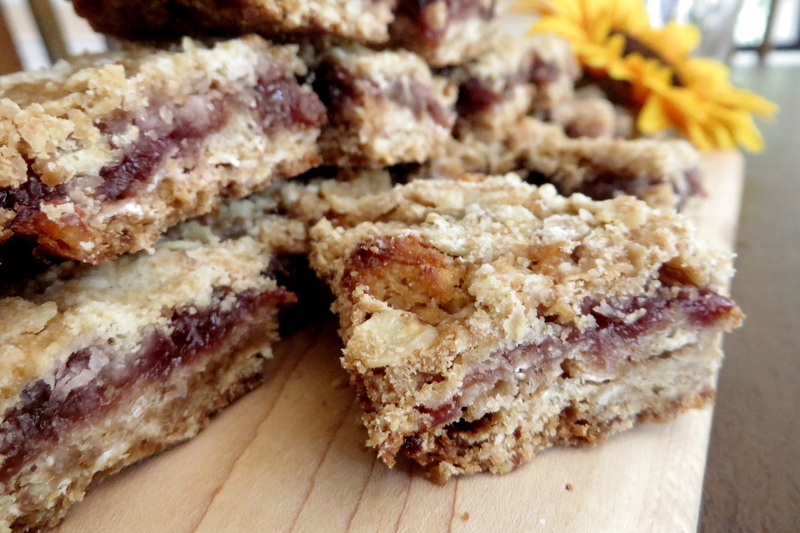 Only you could make over date bars and have them turn out so gorgeous! I wish I had one (or two:) right now! I’ve been missing your blog while I was away this summer, so I’ll be catching up! Aww, thanks so much. I have missed your informative posts too, but like you, this summer has been so busy with travel, but I’m trying to catch up. Look forward to your posts. Looks like a super tasty bar,Loretta! Love it with all the healthy ingredients the strawberry-rhubarb (tart) with the coconut and dates (sweet)!